OLD PARKED CARS. 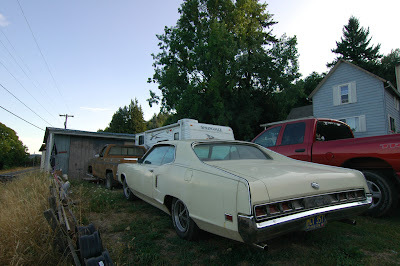 : 1969 Mercury Marauder X-100. 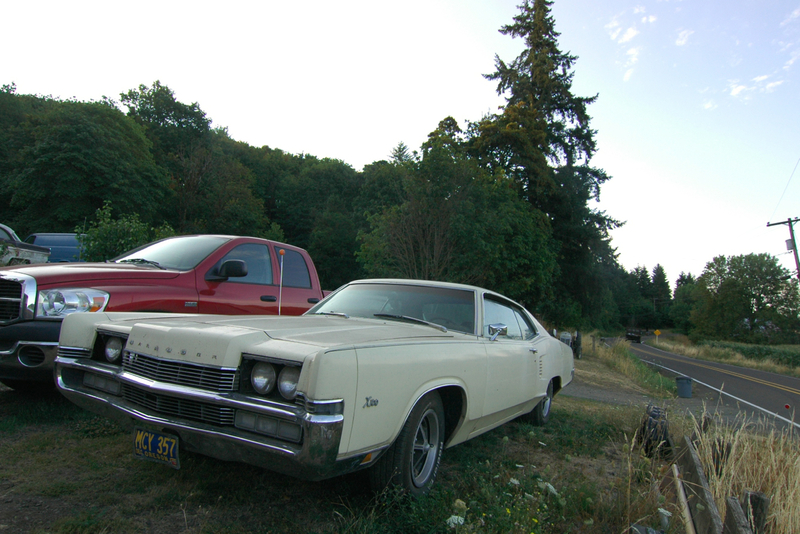 This was Mercury's answer to the Chrysler 300/Buick Wildcat. 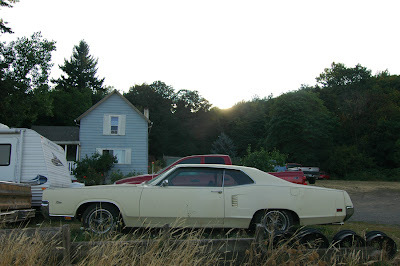 I myself owned a 69 Mercury Marauder in 1998. It was dark green, I don't think it was an X100. I attempted to use it as an everyday car. It was just too old and the engine couldn't handle it. I really love old pillarless hardtops. Anyway after that car I finally realized that I needed to start driving a modern car for every day use. Sunday newspapers. Aside from being very thirsty, that big brute never missed a beat! It was the fuel issue that sealed the car's fate. My wife told me to get rid of it or else. wow, the first marauder spotting since 2010. pretty funny that i've never seen one and you've posted three. not as sleek or appealing as the '64 and '65 you shot, but definitely an opc. Nice find. There is a white 1970 Cadillac Deville convertible parked outside my apartment right now. It's so close to the Eldorado that Johnny Depp drives after the Impala in Fear and Loathing in Las Vegas. I had to stare at it for a little while lol. 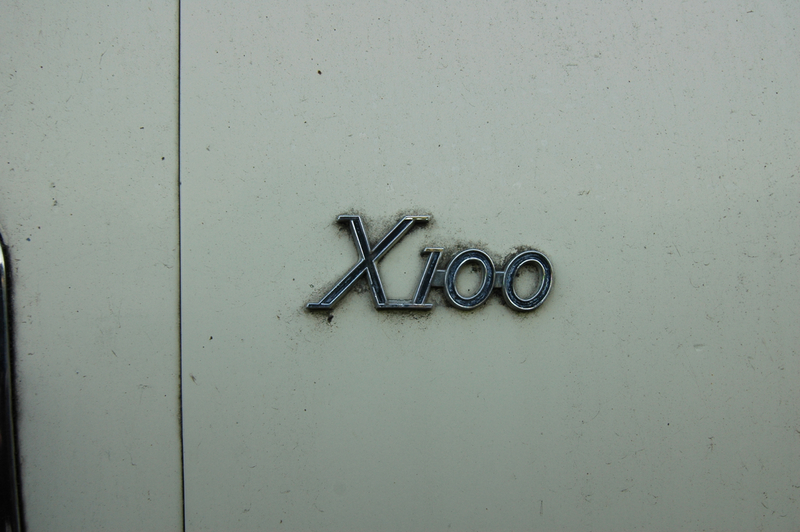 Didn't all X-100s originally come with matte black rear decks? That's what made them look so distinctive. It's a helluva thang... a helluva thang. One hell of a muscle-yacht. Ben, Tony-you guys wouldn't happen to know what's up with the couple month absence on The Street Peep or why OPC Nebraska shut down, would you? Hey the one I had did not have the 428 Engine. It might've been the 390. What's that I see behind the pseudo macho bro truck? Did you get pics of it? Looks like a 1950s Ford to me. Every Marauder prior to 1969-70 was simply a trim package; not a distinct model. The name was first attached to the mid-year 1963 full size Mercury fastbacks (Monterey, Park Lane, etc). The base 69-70 Marauders (minus the X-100 option) had 390 2bbl engines; skirts, Magstars, bucket seats, etc, were optional. in the rear but the 1970 did not.